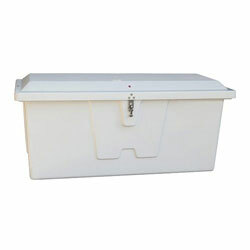 The fiberglass molded Stow 'n Go Dock Boxes are construct with a smooth interior finish which helps prevent splinters in your hands when storing or retrieving your boating accessories. Sure to hold up in the harshest marine environments! Gas shock lifts to keep your lid open on rocking docks and in higher wind areas; allows for a slower, more controlled closing. Size: 24" x 54" x 22"